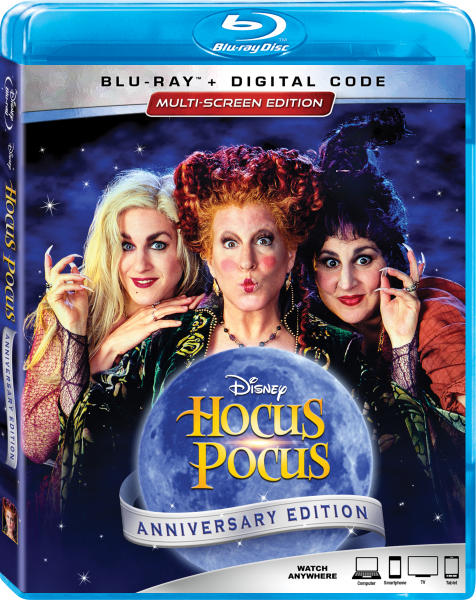 Hocus Pocus, one of the campiest cult classics ever to be cooked up in a cinematic cauldron, delighted audiences 25 years ago. And as the new anniversary Blu-ray proves, the movie has never lost its magical touch. 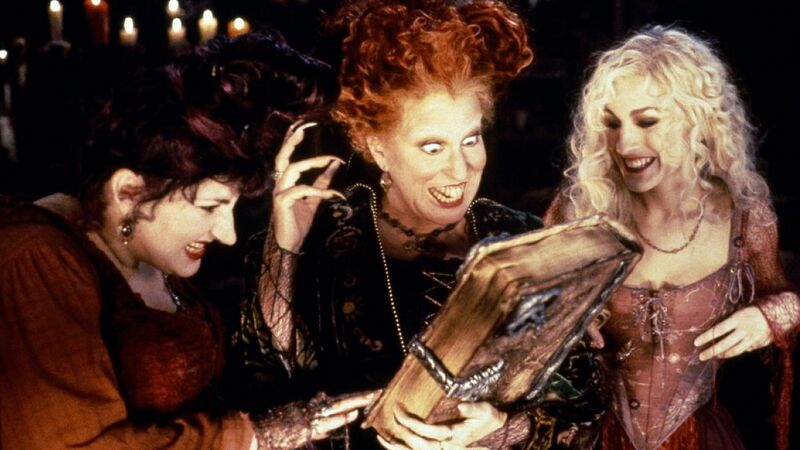 The story centers on the witchy Sanderson Sisters played uniquely and expertly well by Bette Midler, Sarah Jessica Parker, and Kathy Najimy, who haunt Salem, Massachusetts upon awakening from their 300-year slumber. The only ones who can stop them are, ironically, the ones who woke them up in the first place: teenagers Max (Omri Katz) and Allison (Vinessa Shaw) and Max’s younger sister, Dani (Thora Birch), assisted by a cursed, immortal, talking cat, and a resurrected zombie (Doug Jones). There’s a reason that Freeform plays this flick a bunch of times during their annual 31 Nights of Halloween fest, but now you can pick up a tricked-out copy of your own. This new 25th anniversary Blu-ray is part time-machine, part display of modern tech. One bonus feature goes all the way back to 1993 to revisit the movie’s original “making of” featurette, which is just delightful with the benefit of 25 years of hindsight. The more modern angle is featured in the Blu-ray’s “Trivia and Treats” edition, which takes trivia, script notes, concept art and storyboards, deleted scenes, and on-set interviews, and threads them throughout the telling of the tale rather than keeping them as separate menu entries. It’s clever, and it’s a super-fun way to watch the movie again for the first time! David Kirschner comments on the story’s creation, inspired by coming up with an adventure tale for his daughter about a boy turned into a cat by witches. Originally, the witches used candy crows to lure and capture children. Lots of trivia like this pop up throughout, through the use of script notes layered over scenes and text across the screen. Sean Murray (Thackery), back in ’93, tells the tale of how he lost a nice prop cross he wore around his neck somewhere in the forest. The prop guys glued two twigs together as a makeshift cross used for the rest of the movie. “Halloween House” was this movie’s working title; it’s known as “Abracadabra” in other territories outside the U.S. The prop team shows the versions of the Book, an animatronic one and a practical one with all the spells written in it. Najimy conjured a hound dog for her performance, apparently. Image via Walt Disney PicturesSome gorgeous concept art throughout that would make for a really nice collector’s edition art book. One of Sarah Jessica Parker’s ancestors, some ten generations back, was arrested for witchcraft. Director Kenny Ortega and Bette Midler comment on what Winifred would look like, especially accenting her vanity. They used concept art and historical records to find inspiration for her make-up, hair, and appearance. There’s a fun “Spell-a-Long” function that lets you practice the witches’ spells while they cast them. There’s also apparently a “virgin” counter for every time someone says the word; final tally: 9. Rosie O’Donnell was originally considered for the part of Mary Sanderson, which Najimy would go on to play. Halloween in 1993 actually fell on a Sunday, not a school day like the movie suggested. Whoops! There’s a good number of deleted scenes scattered throughout, too, like an extra one-liner from Najimy and more scenes between Max and his dad, and between his parents themselves. Vinessa Shaw talks about being selected to play Allison the night before the production planned to go into rehearsal. The production designer Bill Sandell and Ortega talk about researching and building the Sanderson House. Image via DisneyThat “witch walk” the Sandersons do is referred to (by the actors) as “slurking”: slinking and lurking. The visual effects team says that this movie is the first time a computer-generated character was used, that character being Thackery Binx. They also predicted a sci-fi movie could soon show off photo-real computer-generated creatures, just ahead of the release of Jurassic Park. Additionally, eight black cats were used to play the part of Binx. Six animatronic cats were used to complement them. Doug Jones, of The Shape of Water fame, also played the risen zombie, William Butcherson. It took Jones two-and-a-half hours to get his make-up, and another 45 minutes to remove it. FX Makeup Artist Billy Gardner and the stunt performer go through the process of pulling off the scene in which the zombie loses his head. Literally. An earlier version of the script saw Billy the zombie joining a conga line and having fun at a party, beginning his transition away from villainy. Ortega says that 90% of the flying was actually Midler, Jessica Parker, and Najimy. Jessica Parker may have been flown into a tree once, according to Najimy. In all, there were seven statues of the defeated Winifred created. A different ending had Binx the cat surviving, but unable to talk. It also ended with an “incredible, enchanting kiss” between Max and Allison! Fun and funny behind-the-scenes montage featuring Jones, Gary Marshall talking about acting opposite his sister Penny, and on-set outtakes and bloopers. Bette Midler talking about filming with “blue screens” made my day. This heavily produced featurette goes behind the scenes for the film’s special effects, stunt work, and magical maneuvering like flight. There’s commentary from the three leading ladies, the male lead, and the special effects crew, but it’s very much a canned look at the movie itself.